Both, a radius-turning tool and a boring head essentially consist of a tool slide that rotates around an axis perpendicular to that of the sliding movement, allowing the radius of swing of the cutting tool to be adjusted. Initially I had contemplated to adapt the geared dividing head and an existing boring head for the purpose of radius turning. 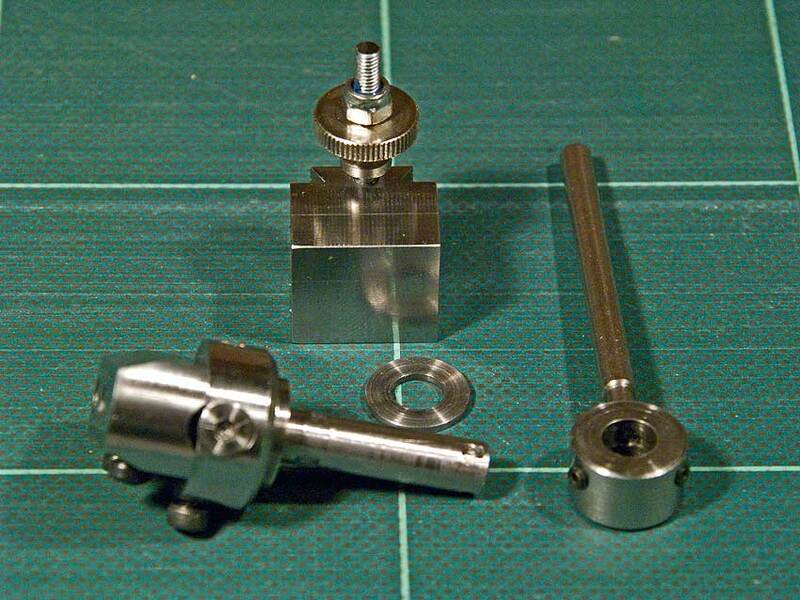 However, it would be rather awkward to change the whole assembly during machining operations. In addition the overhang of the boring head would be considerable. Hence I decided to construct a tool from scratch. I was lazy, however, and did not make any drawings, just worked by eye. 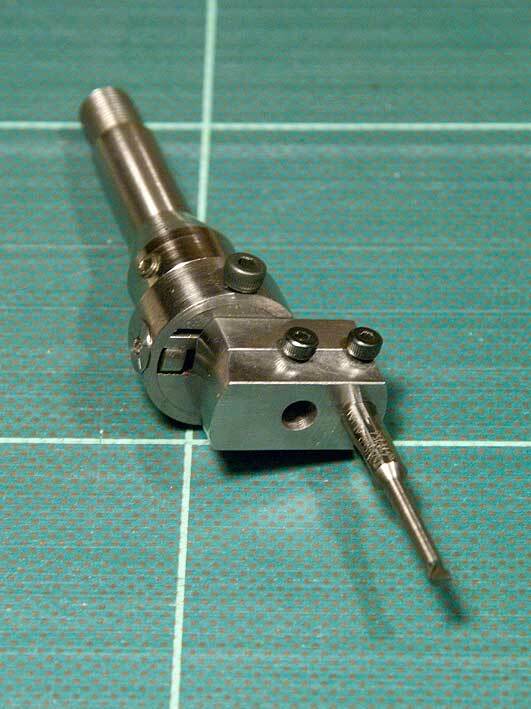 Design specifications: the radius-turning tool should be capable to produce spheres with a diameter as small as 0.3 mm, while the maximum capacity should be around 20 mm diameter. 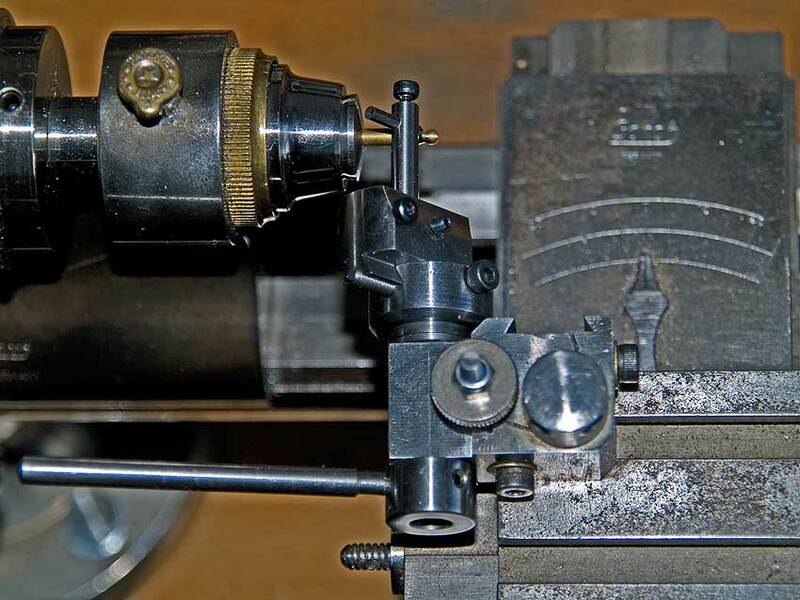 In addition, there may be a need to turn arcs into parts, which requires the rotating axis of the tool to be above or below the centre line of the lathe. 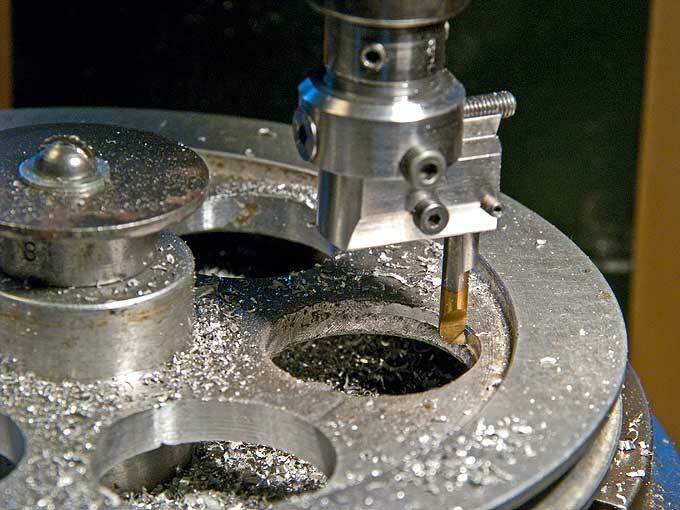 To facilitate complex machining operations, it should be quickly interchangeable with ordinary turning tools. Hence, the radius-turning tool should be an accessory to the quick-change tool post. When I made the quick change tool post, I made a few spare inserts with applications like this in mind. 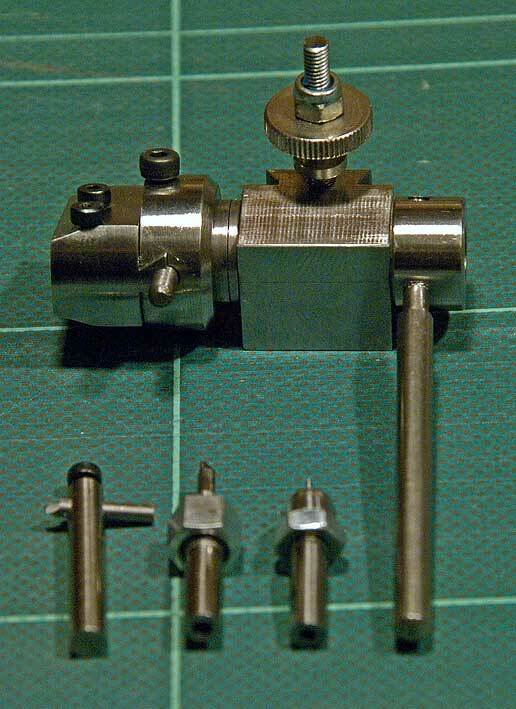 (1) Different views of the assembled radius turning tool and the tool bit holders belonging to it. (3) The tool on the lathe - before a cut. 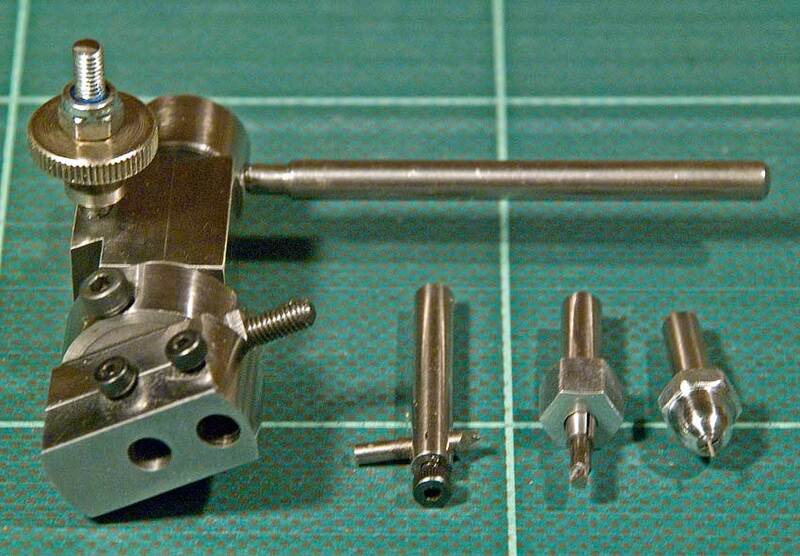 The tool should also double up as an ordinary, if rather small boring head. 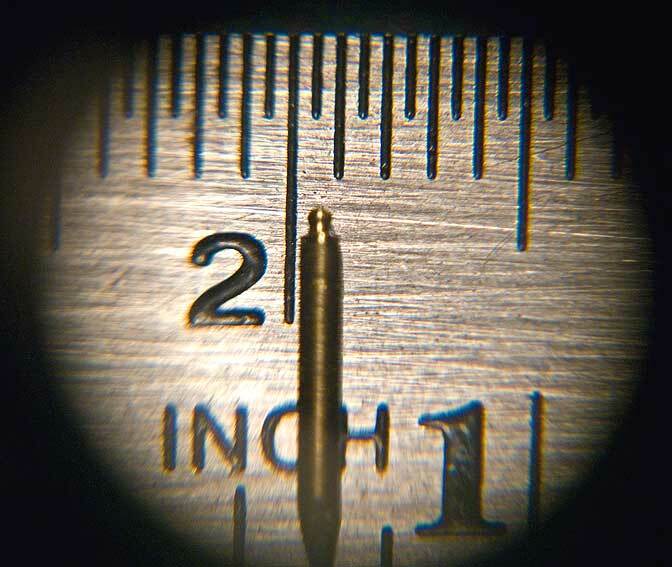 I have a set of boring tools with 4 mm shanks, so the head was configured for that shank diameter. 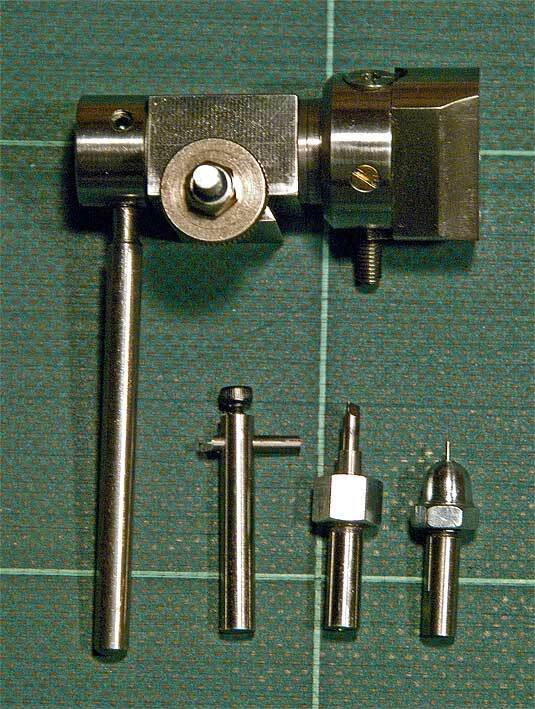 While it would have been a good idea for a boring head to have a collet-type shank, I wanted to keep it interchangeable between the 6 mm and 8 mm lathes/mills. Also, producing a cone seat in the quick-change tool holder would have been rather more involved. Therefore I settled on a straight 6 mm shaft, that can go either into an appropriate collet or into the end-mill holder for the mill. 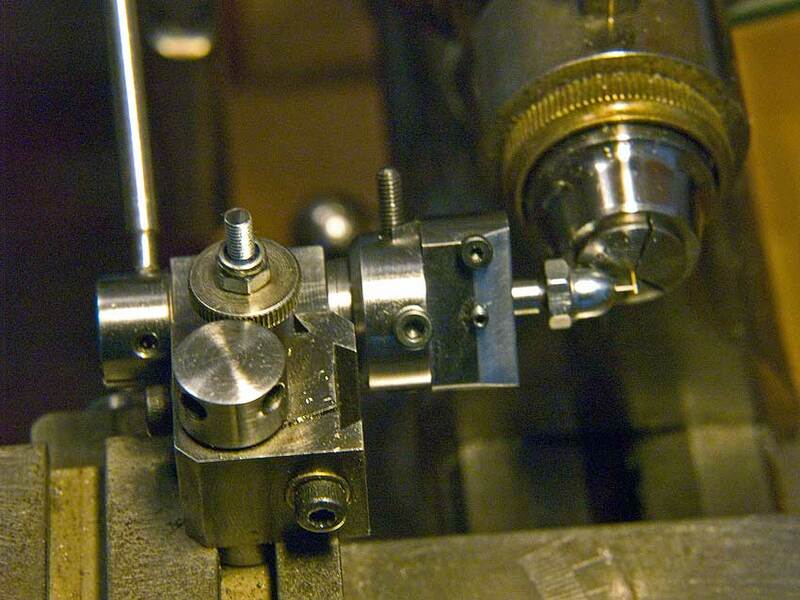 The tool-holder block was squared in the lathe to be drilled and reamed in situ. For the actual head I used material from the scrap box. 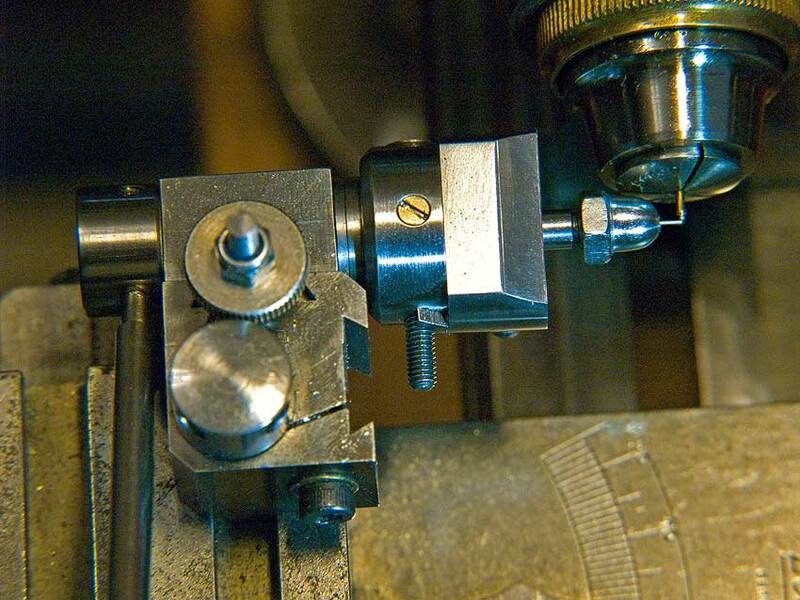 A piece of 15 mm diameter round steel was faced off on the lathe and then set up on the mill for milling the central dovetail slot with a miniature (6 mm) cutter that I had picked up at a flea-market many years ago (never seen anything that small commercially). Rather than providing a gib for the slide, with a circular saw I cut a narrow slot next to the dovetail. This metal wedge is pressed against the slide with a single screw that also serves as a lock. I used the same arrangement on the large boring head and it works very well as movements are only small and in small increments. Before milling the dovetail, cross-hole was drilled through the body to receive the movement screw, which is half in the dovetail and half in the body. This hole was milled away half using a slot mill in preparation for milling the dovetail. The slide thus acts as a half-nut. The movement screw is retained in place by a ring laid around the head. This ring of 20 mm OD was turned and bored on the lathe to a tight fit around the body of tool. After fitting and securing the ring with a sunk head screw, the assembly was returned to the lathe and the shank turned down to the required 6 mm diameter. (7) Turning a 'larger' ball - before the cut. (8) Turning a 'larger' ball - before the cut. (9) As boring-head with end-mill holder (10) The tool mounted in the end-mill holder (11) with boring tool bit (12) Ready to work in the vertical mill. (13) Cleaning out the relief holes in a pulley. The tool slide itself is fashioned from a suitable piece of steel somewhat deeper then required. 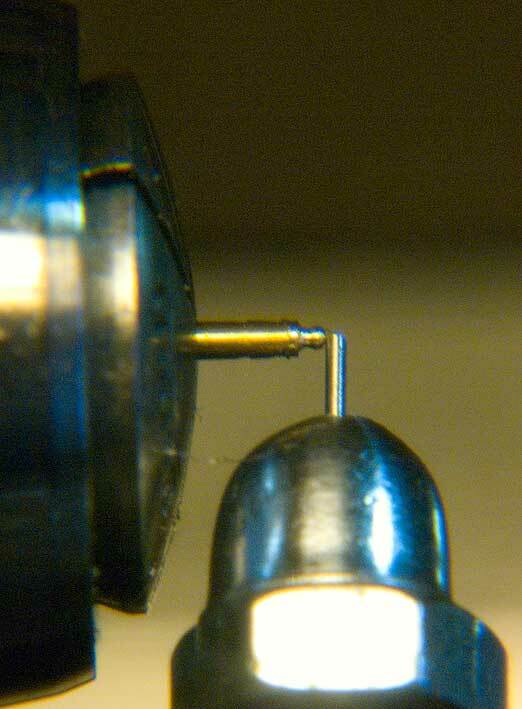 First the hole for the movement screw was drilled close to the end and tapped M3. Then half of the tapped hole was milled away and the dovetail was milled. Two sockets for cutting tools are foreseen. 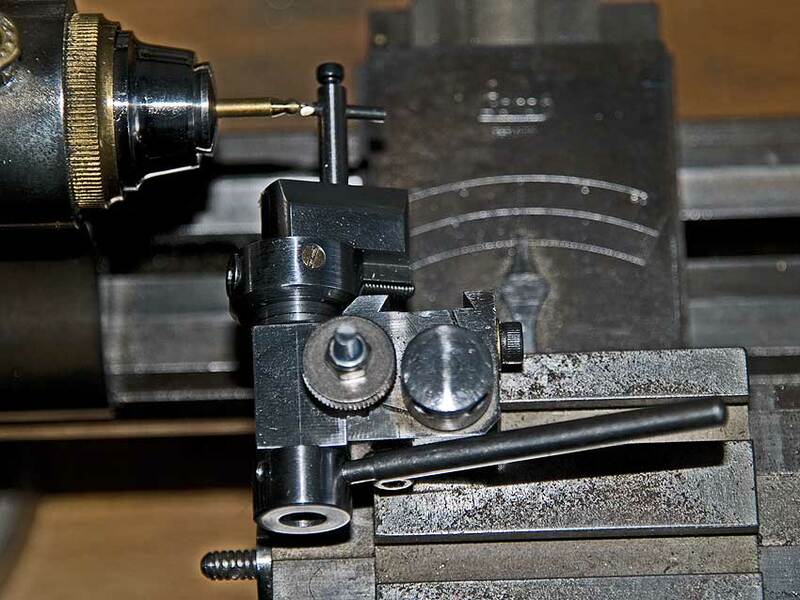 The inner one, which would be crucial for turning very small balls, was drilled and bored while the provisionally assembled head was mounted in the lathe. This ensures concentricity of the tool socket with the shank. The second socket could not be machined in the same way, as the slide could not be moved into the right position. 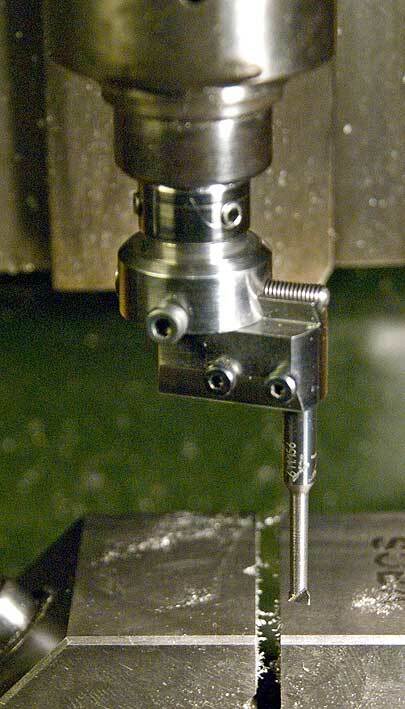 Therefore, it had to be drilled and reamed on the milling machine. The head of the movement screw (which is an Allen sunk head screw) was engraved with five radial marks, indicating a movement of 0.1 mm, based on the 0.5 mm pitch of a M3 screw. It is thus easy to set it in increments of 0.05 or even less, giving a corresponding diameter change twice this. I attempted to stamp the face of the screw with the appropriate numbers, but failed to place the punch with necessary precision in spite of using the punch guide described elsewhere on this site. A round slotted nut set with Loctite keeps the screw in place. Various types of turning tool holders where produced to suit the various envisaged tasks. Shown in the pictures is a more conventional one that is bored for a round tool bit fashioned from a broken twist drill. 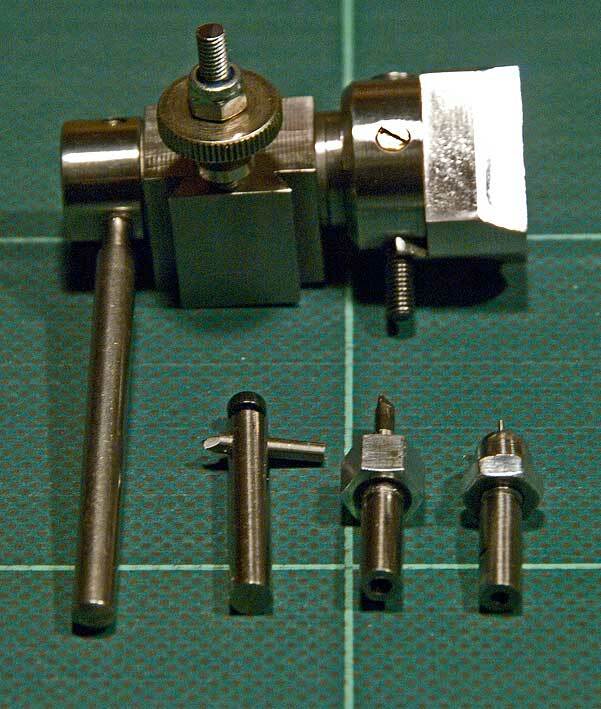 The other two holders are of a collet type to hold thin (down to 0.5 mm diameter) bits that cut at their front face. The idea is to cut with them a double radius whereby the ball merges into the stem via a S-curve. These collet-type holders where turned from a piece of 4 mm round steel. 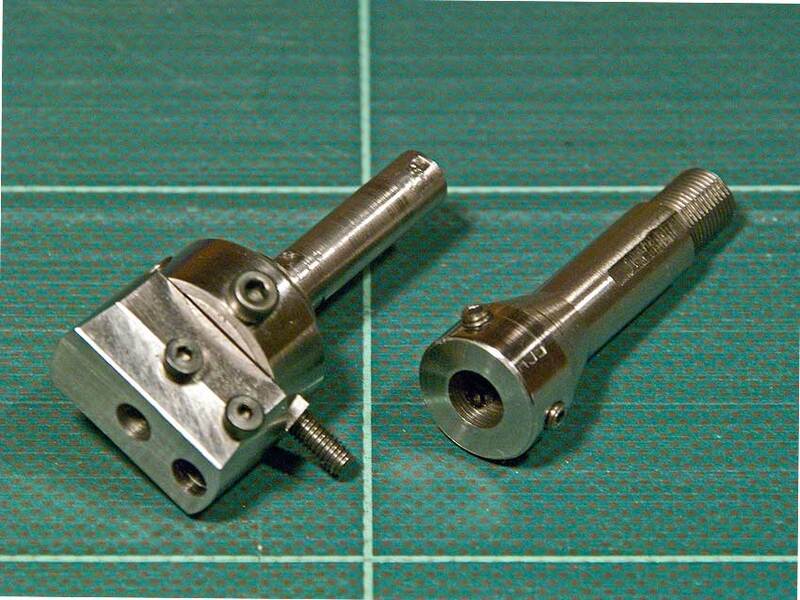 The front end received a cone and they were drilled and reamed to the desired toolbit diameter. 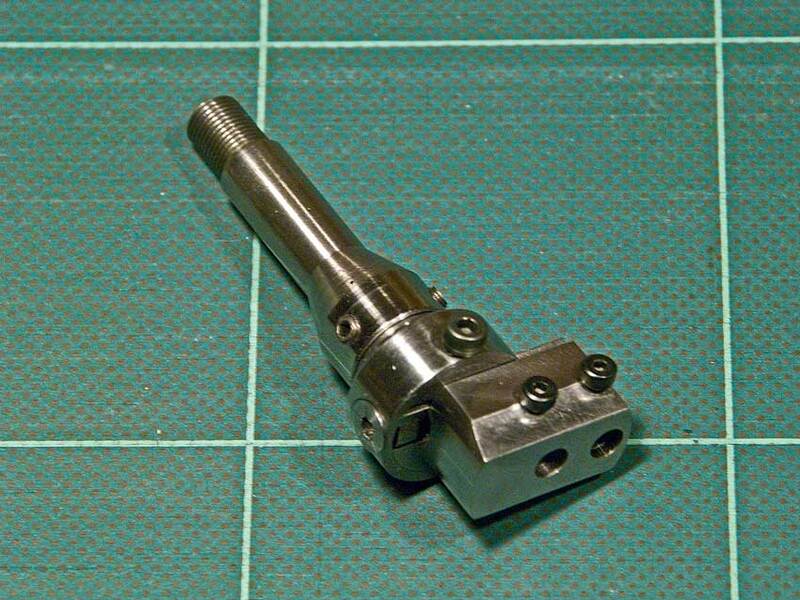 An M4 thread was cut on the lathe for the cup nuts that were drilled and reamed to fit the cone on the holder.